“If you can tell your story with a graph or picture, do so,” says Marc Bellemare, my first guest in this episode. The picture on the left is one of his: “a graph that essentially tells you the whole story in one simple, self-explanatory picture.” Yes indeed, social unrest is caused by higher food prices.1 I could leave it at that, along with a link to the paper from which I lifted the picture. But this is a podcast. I have to talk to people, and that includes Marc Bellemare. Bellemare’s paper is a global investigation that doesn’t even attempt to ask whether the relationship between food prices and social unrest holds for countries or smaller areas. My sense, though, is that the relationship is strongest in more authoritarian regimes. At least, that’s where we’ve seen most food riots of late. In this, however, it seems I am mistaken. Marc pointed me to Cullen Hendrix, who has studied the links between social unrest and political regimes. Placating the urban masses who eat food at the expense of rural people who produce it has always been a fraught proposition, perhaps even more so for democracies. All of which raises the question that, I hope, keeps food policy wallahs and agricultural development experts awake at night. What’s so wrong with high prices anyway? 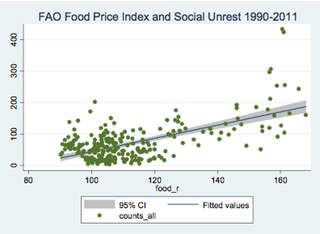 Food Price Volatility, and Social Unrest. He also examined some of the reactions to the paper. “Even when presenting to the smartest people in the world, a picture is really worth a thousand words.” Find this and Marc’s other tips for conference and seminar presentations here. The sound montage at the beginning draws on various reports on Haiti, Egypt and Tunisia, all glued together by a splendid recording of a protest march. The banner photograph is adapted from an original by Martin Bureau/AFP/Getty Images. Jeremy mentioned this on fornacalia.com.